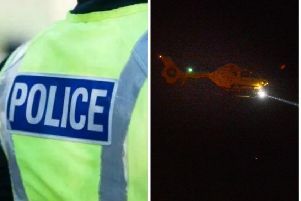 A 21-year-old man has been arrested in connection with the incident. Ryan Currie, 23, of Didsbury, told the Press Association he saw three people and a dog get “launched into the air”. He said: “The car then drove through them and carried on without stopping. “At this point I heard the dog yelping and running round, loads of people ran over to attend to the injured. There is no evidence to suggest the incident is terrorism-related at this stage, Greater Manchester Police said. Chief Superintendent Jo Rogerson said: “We now have a man in custody and we will be questioning him under caution as part of our investigation.